The various types of accommodations at Boomhiemke holiday park are spread throughout the park. You have your choice of seven different types in a range of sizes. 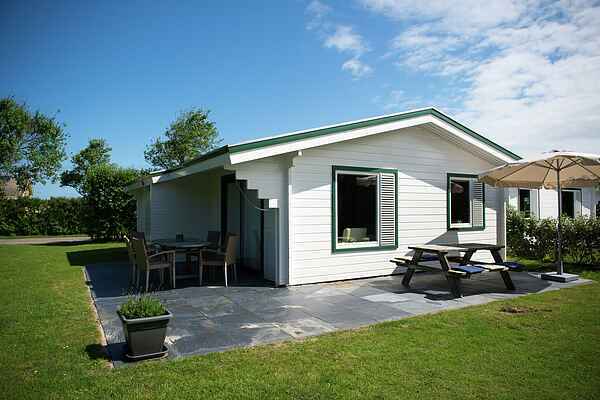 There are three different 4-person accommodations: a luxury detached single-storey thatched bungalow with two bathrooms, one with a hot tub, washing machine and dryer (NL-9161-31), a luxury detached single-storey bungalow with a 2-person sauna, hot tub, sun lamp, washing machine and dryer (NL-9161-32) and a link-detached bungalow (NL-9161-33). There are also three types of 6-person accommodations, all link detached. There is a thatched villa (NL-9161-34), a single-storey bungalow with a charming sleeping alcove in the living room (NL-9161-35) and a charming wooden Finnish single-storey variant two bedrooms with two single beds and a bunk bed for two people (NL-9161-36). Finally, there is a detached 8-person thatched villa (NL-9161-37). Some of these villas are equipped with an open fireplace, these can be reserved with preferential costs for € 19. All accommodations include a terrace with garden furniture. All the bedrooms are equipped with comfortable box spring beds. Type NL-9161-34 is located in a separate section, about 2 km from the main part of Boomhiemke. Here you will find a total of nine villas just 100 metres from the dune and beach.